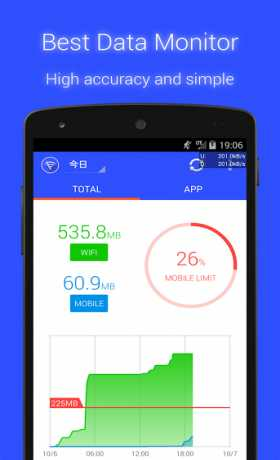 “Data Usage Monitor” is a user-friendly app for you to manage your data usage. This app helps you to accurately measure your daily data traffic, and analyze the data in a way easy to understand. It also pops up warnings when you are reaching the traffic limit, which protects you from data overuse. 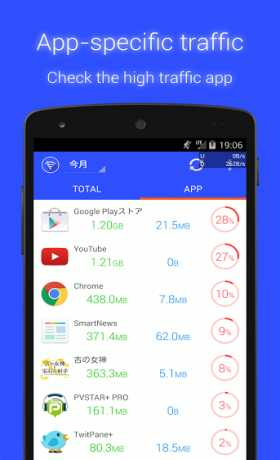 Please try this app to manage your data usage and plan the best way to control your data traffic! ・ Automatic Traffic Measurement – Once you launch the app, it will then measure your data traffic automatically. Whenever you are concerned about your data usage, simply launch the app to check!